1960 (?) 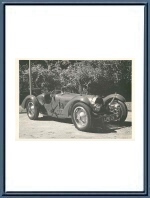 Photograph - Bugatti Type 59 - LPG 211 - Chassis 57124. 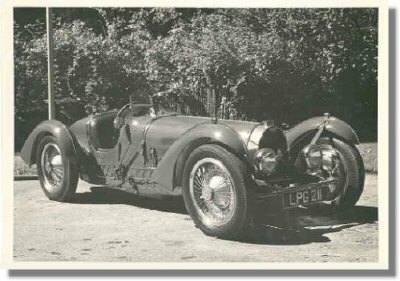 This is a vintage circa 1961 photograph of the Bugatti T59 (Chassis 59124) while owned by Francis H. Ludington of Pelham Manor, NY, USA and carrying license LPG211. The is still carrying its characteristic road-going equipment (riveted seam pontoon wing & lights) which were later removed. This photo is believed to have been taken in 1960 as we acquired it together with a 1960 Bugatti Owners Club Christmas card showing the very same car. It measures some 17.5 x 12.5 cm or 7 x 5 inches. Only 1 pc. available of course.